The second litter of 2017 finally arrived this week, a little earlier than I’d expected but not by much. It’s definitely easier to calculate this sort of thing when using AI instead of letting them run with the boar for a few weeks. The AI date gives a more definite start point but the gestation period can be anywhere between 112-115 days so it’s never going to be exact. As usual it seems, the quiet early hours of the morning were the preferred time for getting down to business. We were determined to supervise this time after the previous pig had farrowed when no one was around and a few piglets were lost as a result. 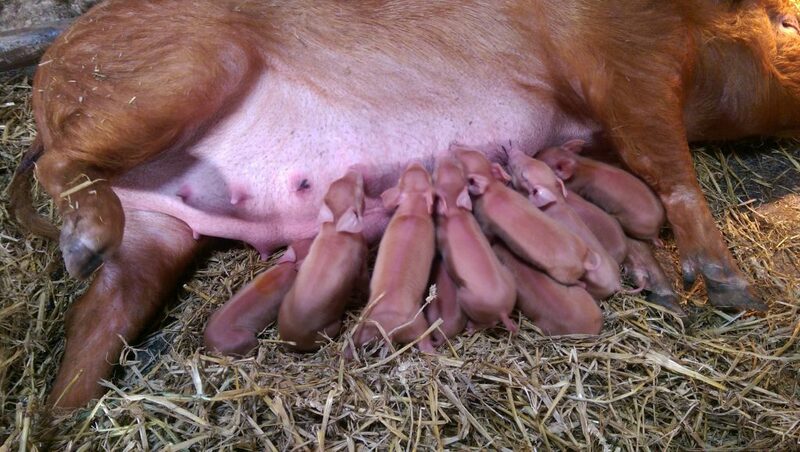 This time Esther managed to produce a total of 11 piglets with 10 born alive and just one that was already dead on arrival. Sometimes these things happen and we have to accept it but that doesn’t make it any easier. 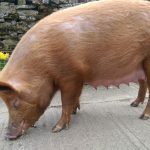 I had watched the sow over the previous few days in the hope of learning more signs to look for when farrowing is imminent. I’m not sure whether I learned much but at least I got some useful photos that I can refer back to for comparison purposes when future litters are almost due. 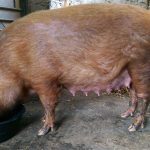 On the day before farrowing there were some good signs that it wasn’t far off – for example, a great deal of “nesting” activity with the bedding straw and a general feeling that she wasn’t settling down. I also noticed that she seemed to drink more water than usual but I don’t remember seeing that before previous farrowings so maybe that’s misleading. After waiting around for a few hours during Tuesday evening I eventually made sure she was comfortable and went to bed about midnight with plans to check again later. Sure enough at about 1:15 we discovered that 2 piglets had already made an appearance and the sow was getting ready to produce more. Given the size of the litter, it’s no surprise that some were distinctly smaller and more delicate when they first arrived. However a bit of warmth makes all the difference so they were soon getting stronger and were able to start suckling on their own. 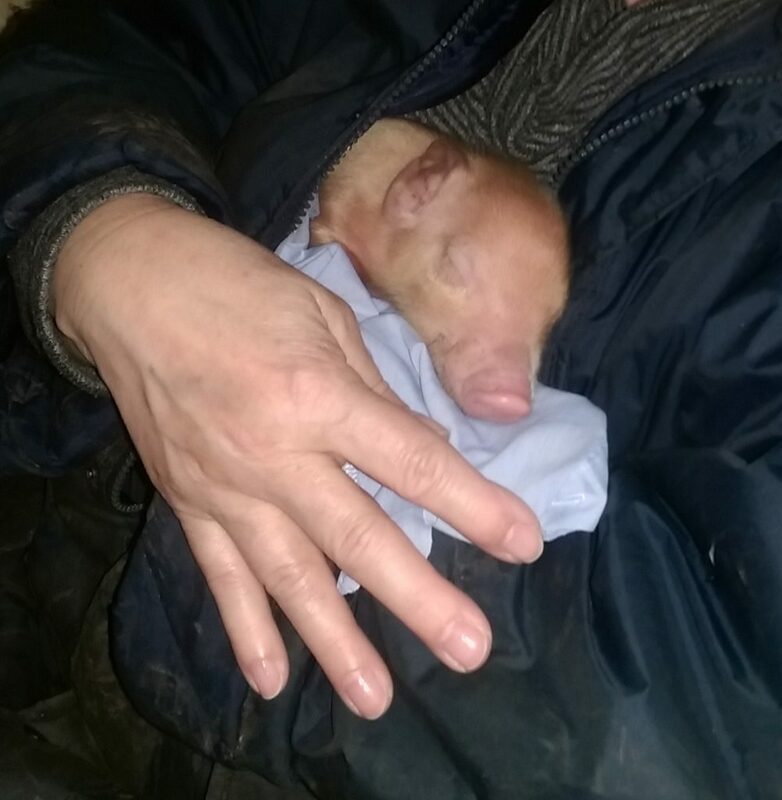 In the end we spent about 5 hours out in the farrowing shed making sure the newborns were safe and settled under their heat lamp. There was also a little extra care and attention for the sow as she had the hardest job of all in my opinion!